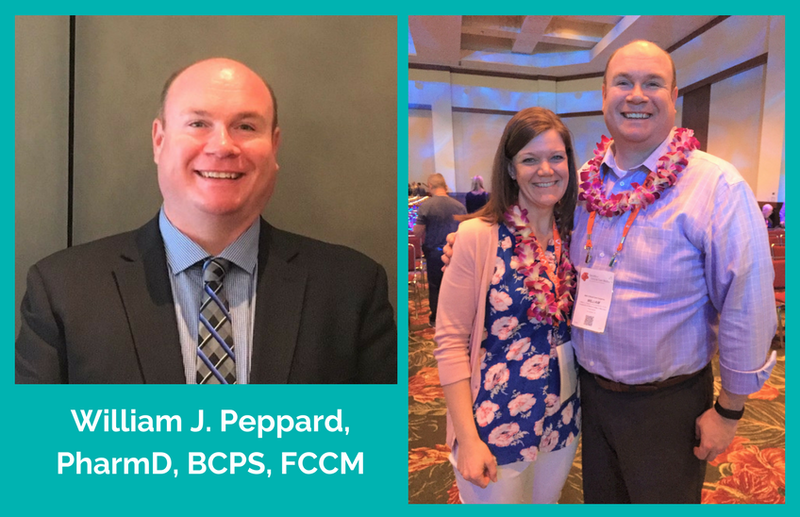 Meet your pharmacist, William J. Peppard, PharmD, BCPS, FCCM! Dr. Peppard is a busy man—he is a Trauma/Surgical Critical Care Pharmacist, Director of PGY2 Critical Care Residency at Froedtert Hospital, and Assistant Professor of Surgery at Medical College of Wisconsin. We sat down with Dr. Peppard to better understand, why pharmacy? What attracted you to become a pharmacist over other health professions? A couple upperclassmen in high school turned me onto pharmacy, and as I investigated it further I found that it was something that I was really interested in. I like the chemistry and science behind the drug development, and the “puzzle” of trying to fit them together with one another to make the best match and optimize outcomes. You wear many hats. What makes your healthcare professional career path unique? I get to teach, help peers develop professionally, and provide direct patient care on a daily basis, and I love it. Nearly every day of work I have 1-3 pharmacy learners with me, and I provide education to physician students and residents, as well. My job is as much about teaching and communication as it is about patient care. If I were asked to describe the most rewarding day of my career, it would be difficult to identify a single day, since I find providing exceptional patient care rewarding on a daily basis. It is a work hard/play hard lifestyle. I work a 7 on/7 off schedule (Pharm4Me note: this work style of days “on” (working) and 7 days “off” (not working) is unique and not typical). My work day is intense, especially after 7 days in a row. I love spending time with my family, I make that a priority, and I don’t ever let my job get in the way. That makes for a very hectic work week. I like to use my first off day to relax, a mental health day for myself. This is really essential for maintaining that work/life balance long-term. After that first day off the play hard fun begins! I would say my balance is healthy, and that setting priorities is key to keeping it that way. I love all the people I work with, and providing patient care, but I am an educator at heart, so above all else I like to see the personal and healthcare professional development of the residents that I train. I have always been very supported, and have always been trained to set high goals and “raise the bar,” but I wish someone had impressed upon me the importance of thinking outside the box. What’s the best advice you were given in your career? It does not matter how smart you are if you cannot communicate with those around you. If you cannot implement a care plan for a patient because your ability to connect and relate with your peers is lacking, then you are ineffective—no matter how smart you are. Also, your peers will almost always prefer to have a coworker who is friendly rather than coworker who is really, really, really smart. What do you believe to be the biggest misconception about pharmacy healthcare professional careers and how have you worked around it?